JERUSALEM (CNN) -- Israeli Prime Minister Benjamin Netanyahu plans to approve building hundreds of new settlements in the West Bank before considering a freeze on construction in the area, a senior Israeli government official said Friday. 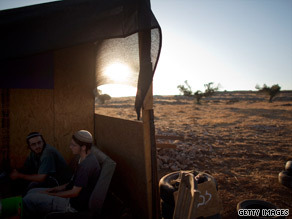 Israeli settlers in an outpost last month in the West Bank, where new housing units are a contentious issue. The move comes as Israel and the United States have been increasingly at odds over President Obama's insistence that Israel's government freeze all settlement activity as a necessary step toward advancing negotiations with Palestinians. The new housing units will be in addition to about 2,500 more that are in various stages of construction, the official said. Netanyahu would consider a moratorium on construction, but he has said that the moratorium would not apply to East Jerusalem, according to the official, who did not want to be named in advance of an expected government announcement. The prime minister plans to discuss the issue with U.S. Middle East envoy George Mitchell, who is scheduled to come to Israel next week. Obama administration officials, however, were quick to express their strong disapproval of the new construction. "The United States does not accept the legitimacy of continued settlement expansion and we urge that it stop," the White House said in a statement. "Continued settlement activity is inconsistent with Israel's commitment" to the peace process. Israel has claimed East Jerusalem as part of its sovereign capital since taking the eastern part of the city from Jordan during the Six Day War in 1967. Palestinians want East Jerusalem to be the capital of a future Palestinian state. CNN's Kevin Flower contributed to this report.